I love salad. I make a salad almost every night of my life. I almost consider the salad the center of the meal, and everything else as a side dish that goes along with it. I have a very simple way of making salads, I like to let the flavor of the greens speak for itself. So here’s what I do. I usually combine 2 or 3 types of lettuce. I like romaine for crunch, red leaf for flavor, and arugula or baby spinach because THEY’RE SO DELICIOUS! This is a pretty cost-efficient way of doing things, as well, because romaine and red leaf are generally reasonably priced. I’m lazy about washing lettuce, but I know it has to be done, so I’m very glad to have a salad spinner. I let them soak in cold water, hoping that all of the dirt and bugs will rise to the surface. Then I try to go through and check each leaf, making sure it’s dirt free. Give it a spin, and it’s nice and clean and crispy. I cut the leaves with a knife. I put them in a bowl. I mix them up with a big fork and a big spoon. Then I drizzle olive oil over, just enough to coat each leaf. I mix them up again with my big fork and spoon, making sure each leaf is well coated. (but careful not to bruise them). Then I sprinkle on a little salt. (I like sea salt, but any salt will do). Mix it up yet again. Then I sprinkle on a little vinegar. Most nights I’ll use balsamic, but sometimes I’ll use white wine vinegar or lemon. Then I put tons and tons of freshly ground pepper, and mix it up again. And that’s it! Simple. 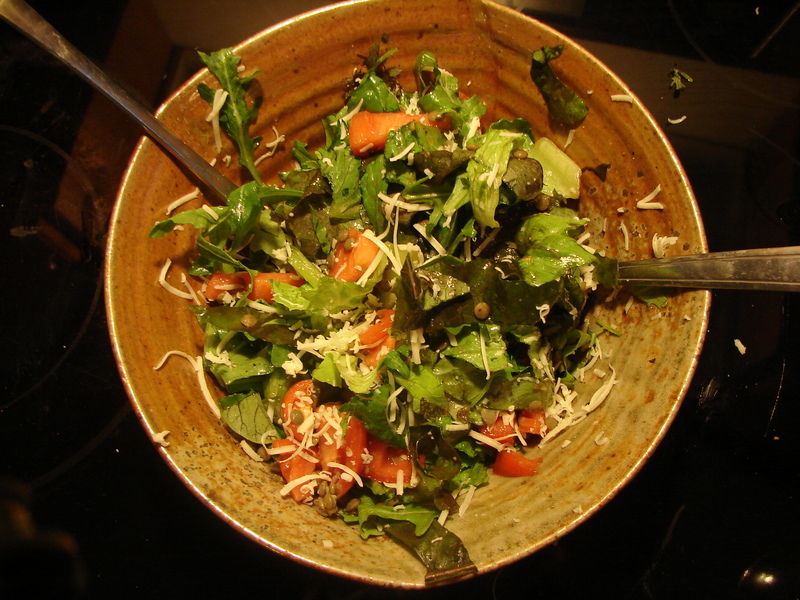 This entry was posted in recipe, salad and tagged dressing, greens, simple salad by Claire. Bookmark the permalink. Don’t cut with a knife! Tear with your fingers. Less bruising of the leaves. French lentils are awesome in salad. I like sunflowers seeds, too, as long as you don’t overdo it. Dried fruit – currents, cherries, and cranberries – is something I keep around in the cupboard to liven salads. Hello, Donald! I bought dried cranberries today, based on your suggestion, and added them with toasted walnuts and goat’s cheese. Very good! And hello hello GHE!! Good to see you. all of your suggestions sound completely delicious! I think you have better lettuce in the UK, too. At least you did when I lived there. Smaller and more flavorful. 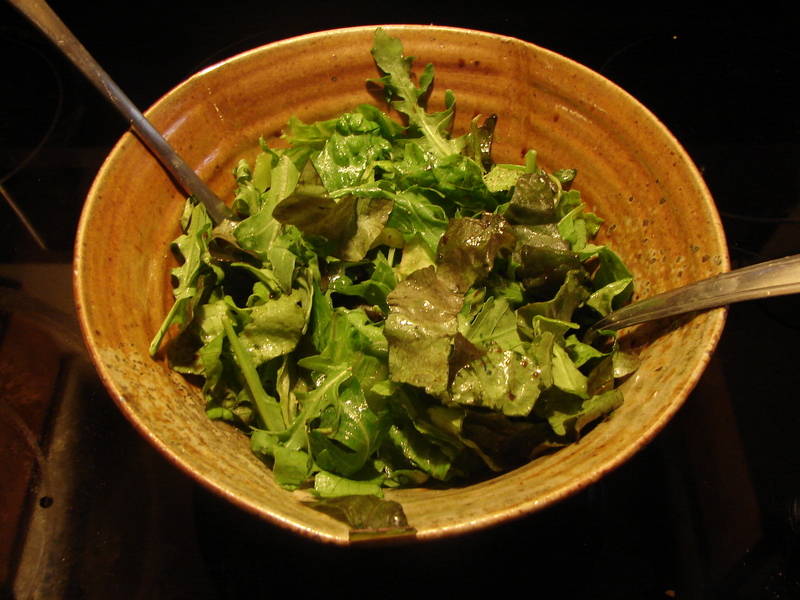 For arugula (which we call rocket), try walnut oil and raspberry vinegar for the dressing. Ah, nut oils!! Something I covet but always feel like I can’t afford. Although one bottle would last a while, right? I may have to splurge. The possibilities of nut oil cookery are endless and exciting. I think walnut oil has a low burn point so I wouldn’t cook with it but it has a lovely smooth mouth feel for salad dressings. Don’t hoard it either, in case it goes off. I wonder if you can bake with walnut oil or hazelnut oil? I’ll do a little research. I’ve been thinking it might be fun to make flavored vinegars – with tarragon or other herbs. They’re so pretty in the jars. In my kitchen, it’s flavoured vodkas. Raspberry, blackcurrant and redcurrant are all lined up on the top shelf ready for drinking around Christmas time.